Well don’t this just beat all… The Karl Marx MasterCard. 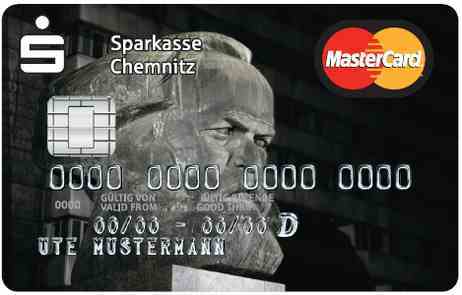 The German bank Sparkasse Chemnitz recently launched a Karl Marx credit card. The bank let people vote online for 10 different images, and Marx was the “very clear winner,” beating out a palace, a castle and a racetrack, among others. I guess MasterCard will be revising their motto. I do dig it. Could there be a better example of irony? Could there be a better example of the ability of the capitalists to co-opt EVERYTHING? Wow, this is a hoot. More like this, please! Great irony.